I thought I'd make a quick Thursday post for a bit of terrain I just completed. 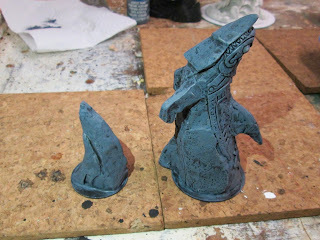 I painted up the Dagon Statue from Bones 3. This figure was added in to the Bones 3 Kickstarter at the very end via the Pledge Manager. 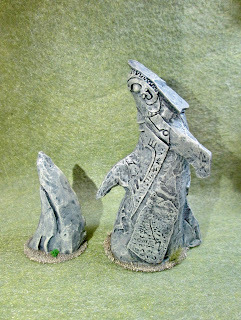 I picked it up, since I figured it would make a good terrain piece for Ghost Archipelago. I prepped the 2 pieces in the usual way; soaking them in a dish of water with a couple drops of dish-soap added, then giving them a light scrub with a soft toothbrush, and then rinsing and drying them. I then glued the large section to a black-primed 2" fender washer, and the smaller section to a 1.25" black-primed fender washer, both with Aleene's Tacky glue. I began by painting both pieces entirely with Black. I then drybrushed them heavily with Americana "Zinc". I then drybrushed both pieces with Americana "Neutral Grey", followed by Apple Barrel "Rock Grey", and then Folk Art "Porcelain White". I let the pieces dry overnight and the next day I gave them a coat of Americana "DuraClear Matte" varnish. 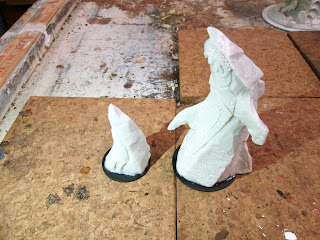 Then, when the varnish was dry, I used some white glue to glue a little sand to the base. When this was dry, I painted the sand with Americana "Asphaltum". When the "Asphaltum" was dry, I drybrushed the bases with some of the Ceramcoat "Territorial Beige", and then some Americana "Antique White". Lastly, I glued on some tufts of grass. I let the figure dry overnight and the next day I gave it a coat of Americana "DuraClear Matte" varnish. 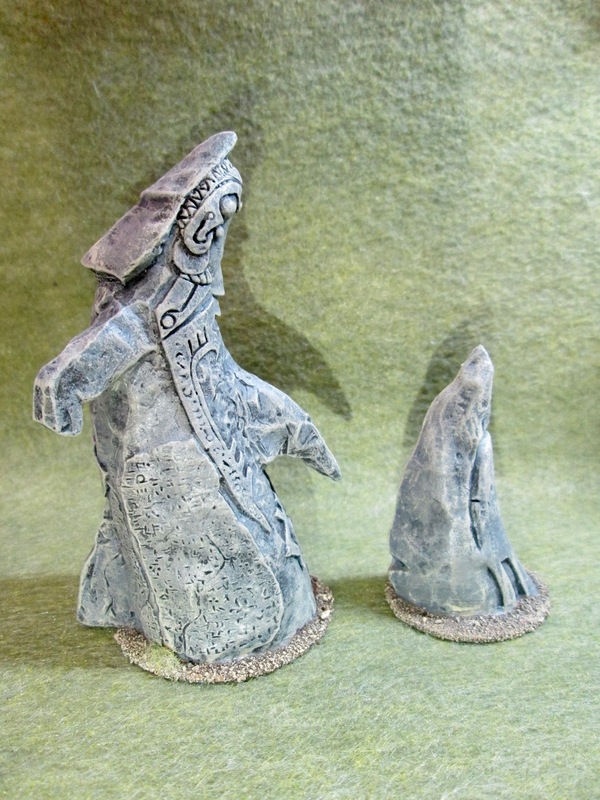 Another overnight dry, and I sprayed the statue with Testor's Dullcote". I'm real happy with how this terrain turned out. It's nothing fancy, but a welcome addition to my growing collection of Ghost Archipelago terrain. Pretty useful peice, and not one I remember seeing during the kickstarter. I like the colors you used partly because they look like real rock, but unusual enough that they would stick out in most gamers "rocks". It was added on in the Pledge Manager, so was never actually unlocked as a Stretch Goal during the normal run of the Kickstarter. Yes, I was rather pleased with how the rock color turned out. I think it works so well because each of the different greys I used had an undertone of different colors, browns, blues,greens; which really helped give a natural look. Bones 4 Kickstarter Enters Last Two Days! The Bones 4 Kickstarter is Live!